Cincinnati City Council approved $775,000 for environmental studies and preliminary engineering work on the Cincinnati Streetcar project that will run from the riverfront, through Downtown and Over-the-Rhine, and go up the hill to the Uptown neighborhoods surrounding the University of Cincinnati. The approval of the $775,000 allows for the City to move forward with the proposed Cincinnati Streetcar and maintain its spot in the contest for state and federal transportation dollars that are necessary in order to make the project happen. The first of such money comes from the Transportation Investment Generating Economic Recovery (TIGER) grants and will be announced in February. The Federal Government’s Grants for Urban Circulator projects will be announced sometime after TIGER, and then money from Ohio’s Transportation Review Advisory Council (TRAC) should be announced this Spring. More money is needed in order to complete the preliminary engineering work and can be approved at a later date – a move that put some on council at ease about earmarking too much money for the project before we know the outcome of said grants. 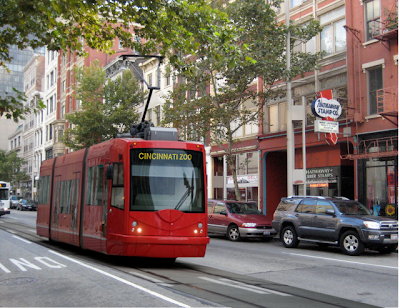 Should all go according to plan, Cincinnati could open the nation’s next modern streetcar system in 2012. Chris Monzel (R), Leslie Ghiz (R), and Charlie Winburn (R) were the three opposition votes. Interestingly enough, all three of City Council’s Republicans have already announced that they will be running for the open Hamilton County Commissioner seat this Fall. Monzel has gone as far to say that he is a “son of the suburbs” and will probably be moving out of the City once he is no longer on City Council.